It's not billionaire executives nor genius engineers who decide whether the world's resources will be used to design and build iPods or Zunes. It's the millions of consumers who choose to buy them. Companies in Redmond and Cupertino simply build their products, advertise them, and then wait to see what the market decides. Markets provide an efficient and fair way to determine how the world's resources will be used. If a company delivers a poor product, or simply fails to campaign for it in the market with effective advertising, consumers will vote with their dollars for alternatives instead. Earning the votes of consumers in the market is a powerful incentive to develop better products. The market rewards companies that deliver the best work, whether best happens to mean cheapest, highest quality, most reliable, or whatever balance of features appeals most to consumers. •When companies only care about being cheap and efficient, buyers end up with a dreary monoculture and are cheated with poor quality, while artisans and workers are exploited. Example: Wal-Mart. •When companies interfere with a market by fixing prices or negotiating cartel pacts, consumers are overcharged and get a poor selection, while artisans and workers are exploited. Example: the RIAA Labels. •When companies monopolize a market and prevent any natural competition from occurring, prices stay high, innovation lags, and the threat of government regulation looms. Example: Microsoft. •When governments interfere with markets and try to set prices artificially, it commonly results in just the opposite of what was intended: production stagnates and prices inch up anyway. Example: The 70s. All of these problems can be corrected by new sources of competition and choice. More competitive choice in the market means more incentive to develop better products, more pressure to lower prices, and less need for the complications of government regulation. Looking at sales figures helps to determine how consumers have voted for the various available choices with their dollars. When presented with little choice, consumers are all forced to buy the same thing. When presented with a variety of choices, consumers flock to the best products, inciting competitors to invent new ideas, copy good ideas, and run their business more efficiently so they can offer consumers lower prices. A more accurate way to look at the market is to look at installed base. That's the same kind of figures commonly used to compare sales of console video games. What is Microsoft's share of the video game console market? What is Sony's share of the handheld gaming market? Don't know? It is certainly not commonly reported, and nobody seems to need to know or repeat those numbers. Why not, particularly since market share is so critically important to relate about Apple’s Mac and Microsoft’s Zune? For console gaming and other markets relating to a platform product--anything that demands a minimum threshold of community or developer support to be useful--the most informative numbers for determining market position and competitive ability are the number of units in the installed base. •Market share refers to a vendor’s percentage of sales in a market over a specific period of time. •Installed base refers to the total number of units sold and in use for that vendor’s platform. In video gaming, it doesn't really matter who leads the overall sales in a specific week or month, only that each platform has enough momentum to sell games. Looking at installed base numbers makes that clear. 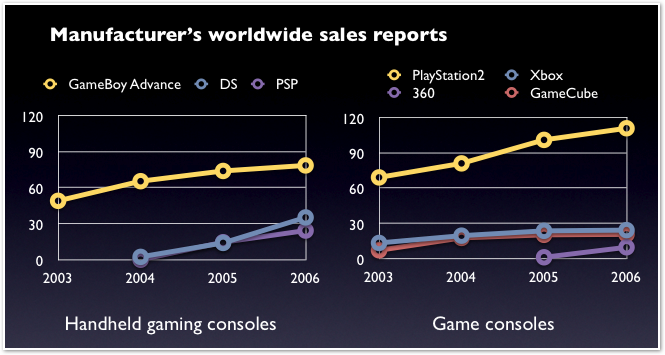 For example, Nintendo has long owned the handheld gaming market, while Sony has long dominated the home console market. What about the market for the Zune among iPods, and the Mac among PCs? Compared to the world of video games, the markets for music players and PCs offer more complications when trying to figure installed base. Unreported Data: Some manufactures don't break out specific sales by model, or don't report their sales at all. Most only report numbers at regular intervals. For example, Apple reports iPod sales quarterly, but does not usually break down sales into specific models. When it reports Mac sales, it doesn't always break down how many were laptops, or how many were professional vs consumer versions. 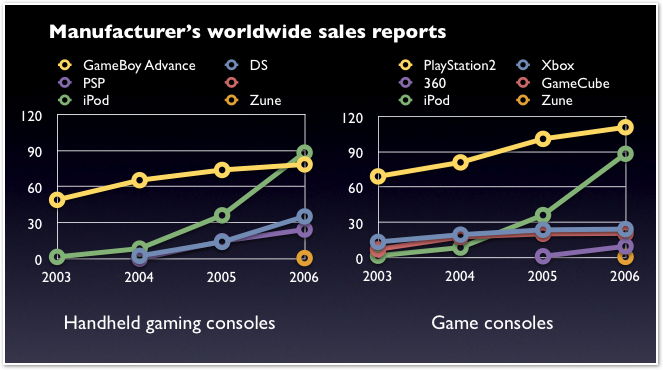 Microsoft has suspiciously never reported actual Zune sales, only throwing out the distraction of a June 2007 “goal” to ship a million units. Channel Stuffers: Manufacturers can stuff the channel with unsold inventory and report it as sold, when it's really only sitting in a warehouse, not part of an installed base. Apple stuffed the channel with Performa Mac models in the mid-90s in the hopes that Sears would sell them just to avoid dangerously tall piles of boxes in its stores. Microsoft is doing the same thing with the Xbox, allowing it to report having shipped 10 million Xbox 360s when sales reports indicate only 5 million have actually been sold. Base Definition: For some products, particularly PCs, it's not known how units will actually be used. 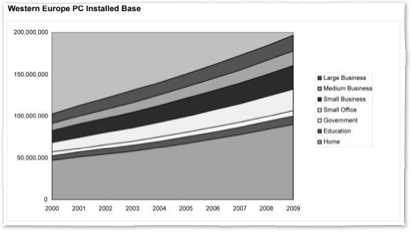 For example, what proportion of PCs are used in the home market, making up an installed base that matters to consumers? How many are still working and in use? PCs have a short life span, and a large percentage--around half, according to IDC--are sold to businesses that dutifully recycle them at regular intervals. Among home users, the epidemic of Windows malware and viruses prompts most users to just dump their existing PC and buy a new one rather than spend hundreds of dollars on tech support to clean it up and keep it working. Maintaining a PC costs professional users around five times as much as a Mac. •Apple extends support for older machines far longer with its operating system software. •Older Macs are faster running a newer version of Mac OS X; older PCs can't even run the latest Windows. •It is easier to support and maintain older Macs; older PCs rapidly become more expensive to maintain. •Older Macs retain a high resale value, older PCs actually have a negative value after the recycling fees. In studying the history of PC purchases made by a client with around a hundred employees, I found the company was still using all of their original Macs dating back to 2001, with a few even older Macs still in secondary use. In contrast, there were no PCs more than three years old still in use, and most of the older models were in poor shape. Around 80% of its machines were PCs, and nearly all of those were commercial grade Dell OptiPlex or Latitude models; the other 20% were Macs. About a third of the entire 115 machines were laptops. The older PCs simply did not make sense to keep around because each used different hardware components, they couldn’t adequately run modern software, and were problematically expensive to maintain, even with a dedicated IT staff available to service them. It was simply cheaper to throw them out and buy new PCs. The resale value for those three year old PCs was basically zero. Had they bought Dell’s consumer brands, such as Dimension and Inspiron, their investment would been even more problematic, more expensive to support, and shorter lived. Their Dell systems cost on average around $1500, but struggled to last for three years. Their Mac systems were closer to $2000, but were useful for six years or more and required less support, making them a better value. Assigning Macs a five year useful life span, and PCs a two year life span, the installed base for Macs among PCs on the planet is around 4.5%. In the US, where Apple sells half of its Macs, Apple has over 8% of the usable installed base: 10 million five year old US Macs vs about 120 million two year old US PCs. There are of course many older PCs still in use, but they are not getting upgrades and new software because with Windows it doesn't make economic sense to invest in old junk when a new PC costs on average $740. A large portion of these older PCs are now running Linux, or alternatively, pirated commercial software, neither of which assists the retail software business. PCs don’t vanish after two years, but they do stop contributing toward a commercial impact on the market. 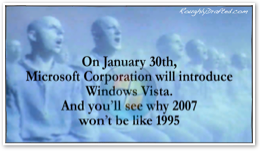 Commercially significant PC users' machines are only a couple years old; that's why Microsoft made no attempt to get Vista working on PCs more than two year old, and why the now discontinued Windows XP was not happy running on PCs built a year or two before it was released in 2001. Looking further back, Windows 2000, 95/98/Me, NT, and even 3.0 all required PC hardware that was brand new. Certainly Microsoft is keenly aware of the PC software business, and if it made any business sense to market an OS upgrade to an installed base of many hundreds of millions of old PCs, it would do so. It does not. The market for Windows upgrades has always been small; Microsoft reports that 80% of its revenues come from OEM bundled copies of Windows. Since retail copies cost around ten times as much as the big OEMs pay: $29 vs $299, Windows upgrades are only 20% of its dollar business, and an even smaller percentage of its unit sales. Microsoft automatically sold 235 million OEM licenses with new PCs last year, but can’t sell even a fifth as many in retail upgrades. Windows PC users do not pay to upgrade their software, they simply throw their old PCs away. Microsoft runs a disposable platform which enriches it at the expense of the environment and its users. In contrast, Apple's Mac OS X Tiger still supports Macs sold back in 1997 1999; those machines are ten over eight years old! Apple has always supported a long tail of old Macs in its latest operating system. In 1998, Apple’s last upgrade for classic 68K Macs updated five year old systems and even ran on some ten year old Macs. No doubt many of the 35 million Macs sold in the last ten years aren't still in operation, but analysts report that more than half are--22 million of them are even running Mac OS X, according to Keith Bachman, an analyst with Bank of America Securities. That reinforces the point that Macs have at least a five year life span. The comparison of life span and installed base helps to explain why major developers such as Microsoft and Adobe expend significant resources to develop Mac versions of their software: it earns them revenues. While a 2% share of the entire world’s PCs wouldn’t suggest much of a reason to target Macs for software development, having 8% of the active US installed base certainly does. 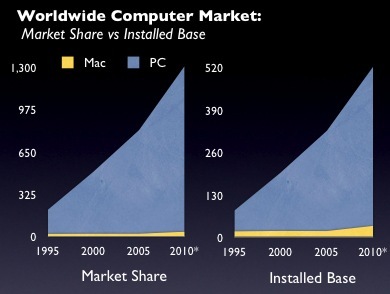 Of course, that 8% figure compares Apple’s installed base against the overall, worldwide PC market. Since more than half of all PCs are used in business, Apple owns an even larger portion of the consumer market’s installed base, where Apple choses to compete. Pulling out business PCs, Apple's share of the consumer PC installed base is above 15%, which correlates with the software available for the Mac. In education, Apple has a 23% share of all new sales in the US, and around 15% in Europe. Its corresponding installed base in education is even higher. PC mercenaries have long ridiculed Apple's Switchers campaign and later the idea of the iPod Halo Effect, but despite market share touting doubters, those two phenomena have had a major impact on Apple's consumer sales, particularly in the US where they were focused. NPD just reported figures that report Apple took 10% of January's billion dollar laptop sales in the retail channels it monitors; recall that NPD only reports on big box retailers, not Apple Stores or any online sales. That means Apple has a much larger share of the retail laptop market than any rival of the iPod has in the retail music player market: more than SanDisk, Creative, or Samsung and far more than the Zune. More importantly, Apple’s 10% laptop share in January is carved out of a billion dollar pie; NPD’s January music player market is a quarter billion dollar pie. That highlights another fallacy common among Zune optimists who like to say that the Zune’s ~3% share of the NPD music player market is better than the Mac’s ~2% share of the worldwide PC market: in the last reported quarter, Zune’s 3% share was worth $7 million while the Mac 2% share was worth $4,400 million. Clearly, market share is meaningless taken out of context, and anyone insisting that market share “speaks for itself” probably has good reason to avoid explaining things. In the final quarter of 2006, Apple earned $7.1 billion in revenue, compared to Microsoft’s $12.5 billion in total revenue. Yes, that’s right, Apple brought in more than half as much money as Microsoft, despite Windows owning 98% of the PC market. Even stripping Apple of its iPod revenues, which PC pundits love to do, the company still earned $4.4 billion on its Macintosh business, over a third as much Microsoft brought in from its entire Windows, Office, and server operations combined. Apple’s 2% of the PC market doesn’t seem so small anymore. Of course, Microsoft actually lost a lot of money on all of its consumer electronics products, so looking at profits, Apple earned $1 billion compared to Microsoft’s total $3.4 billion in profit. The main difference is that Apple actually developed new business in retail and music, and designed the iPhone and Apple TV to sell this year, while Microsoft only defended its monopolies from collapse and designed the Zune. That also helps explain why Apple isn’t interested in throwing away its hardware business in order to try selling Mac OS X to PC makers. If Microsoft only earns three times as much as Apple while sitting on 98% of the PC operating system market, how could Apple make a fraction of its current revenues trying to sell Mac OS X? With Apple selling 10% of all laptops in the general US retail market, it is now back to the same proportion of Macs the company was selling at its heyday in 1991. The difference today is that Apple is selling another billion per quarter in its own retail stores. Around 43% of Apple's revenues are for the Mac, which for some reason PC users like to use in their efforts to discount Apple’s ability to sell Macs. 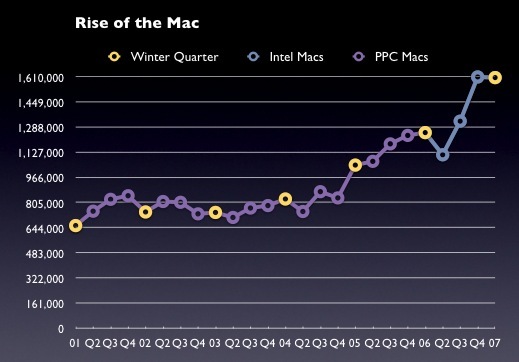 Again, the percentage is a distraction, because Mac sales are actually up. Consumers visiting Apple's retail stores for iPod accessories are now surrounded with laptops and desktops, giving Apple a major bump in the number of Macs it sells. That bump is significant, and particularly kicked in during 2006 with the arrival of Intel Macs. As noted earlier, Gartner reports Apple has sold an average of 17 million Macs every five years since 1991. •From 1991-1995, Apple sold 16.2 million classic 68K Macs.  •From 1996-2000, it sold 17.6 million PowerPC Macs running a version of System 7, the Classic Mac OS. 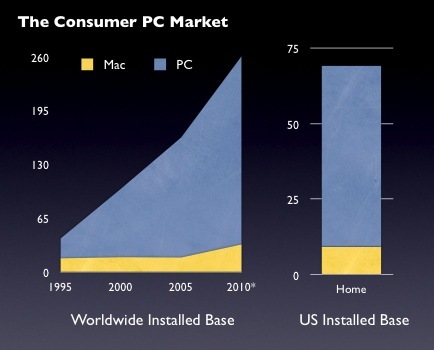 •From 2001-2005, another 17.2 million PowerPC Macs were sold running Mac OS X. •From 2006-2010, Apple’s Macs will be Intel-based, but there won't be just 17 million sold. Between fiscal 2001-2004, Apple was unable to ever sell one million Macs within a quarter; it sold around 800,000 Macs per quarter during that time. In fiscal 2005 (which began in the winter quarter of 2004), Apple sold its first million Macs in a quarter since the tech bubble in 2000. Since then, Apple has never sold less than a million Macs per quarter. For the last two quarters, Apple sold over a million and a half per quarter, double what it was selling just two years ago. By doubling the number of new Macs sold, the installed base of Macs will grow even faster relative to short lived PCs that give up after a brief but troubled life in the virus and malware infected swamps of the Windows world. 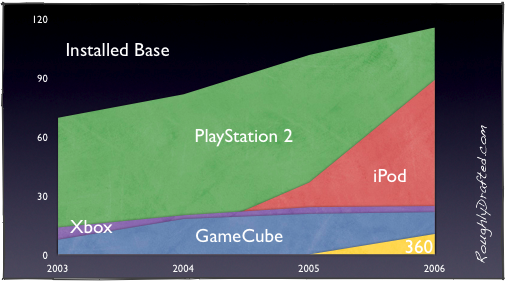 Based on Gartner’s estimated sales forecasts for 2006-2010, Apple’s percentage of the overall installed base will jump by 50%. The worst news for Microsoft is that every new Mac sold to a former PC user means that at least two Windows PCs will go unsold: the initial PC and its mid-life crisis, second string replacement. Compared to the 240 million PCs sold last year, Apple’s small share of around 6 million Macs per year won’t put Microsoft out of business any time soon. However, it means that 12 million Windows licenses will go unsold. That’s up from less than 4 million Macs eating up 8 million potential Windows licenses just two years ago. The faster Apple grows, the more devastating this effect will be to Microsoft's automatic sales machine, which in turn will help open the market up to new choice and options, including Linux desktops. Once Microsoft loses its monopoly control of the OEM market, Windows will fare as well in the market as the Zune. A prime segment of choosy consumers are going out of their way to not buy Windows. Microsoft doesn’t want to dominate the low end of cheap PCs; that market is already headed towards Linux anyway. Microsoft wants to retain the valuable top tier of the PC market, the segment rapidly buying new Macs. That’s why Microsoft is promoting premium products like Media Center, and working to create a pantheon of Vista versions which push consumers to buy higher-end upgrades. Microsoft doesn’t just want “market share,” it wants to make money. Apple wants the same thing, it is just achieving that more successfully. 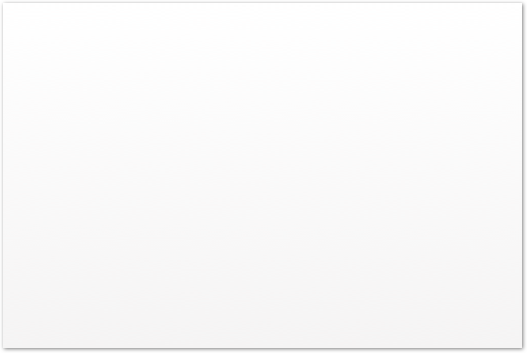 Installed base is flattering to the Mac, but sure isn't for the Zune. That's why so much news was made regarding its carefully crafted market share numbers: without creating the suggestion that Zune had "captured market share," it would simply pale in comparison to the vast installed base of iPods. PC market share numbers are thrown at the Mac to call attention to the fear, uncertainty and doubt that questions whether enough Mac software will get delivered to keep the platform viable. The case for getting a PC is that without enough "market share," there won't be enough software. With the Zune, there is no fear-based argument regarding market share and the availability of software, because the Zune can play any music available on CD. Users with iTunes songs can even burn their songs to CD and upload them onto the Zune player. The only reason to worry about scant market share for the Zune would be related to users who want to take advantage of its ability to wirelessly squirt advertisements of purchased songs to other users: there simply are no other users. Further, a significant chunk of purchased songs can't be squirted anyway. Zune market share is really only a concern for Microsoft, which planned to sell Zune users music using Windows Media DRM. Without an installed base of users, there is no business model behind selling subscriptions of songs that can delete themselves. Zune users don’t need to worry about market share and installed base as long as music is available on CDs or can be downloaded via a format that can be put on their player, either plain MP3 or iTunes’ FairPlay burned to CDs. Market share is only a concern for the establishment of a secure DRM monopoly ruled by Janus. To pacify the most die-hard proponents of squirting, and to suggest that Janus still has a shot at binding the world under one DRM, Microsoft announced that it would ship a million (!) Zunes by the middle of 2007. While this worked well as a smokescreen to distract from the fact that actual sales data was abysmal and does not at all support that goal, and hides the suspicious lack of any real numbers from Microsoft, it still doesn't provide any good news for Windows Media. Even if Microsoft had shipped a million Zunes already, it would barely even show up as a blip on the installed base of iPods, or in comparison to any other recent consumer electronics launches. The chart assumes Microsoft will actually eventually sell a million, and credits those million back into 2006, just to be charitable. Even so, one million units in seven months of sales is simply nothing in consumer electronics. In reality, Apple will sell roughly another twenty million iPods by June 2007, blowing its green line out the top of the chart and leaving the Zune an invisible dot in Apple's rear view mirror, even if Microsoft can meet its goal by stuffing the channel with unsold Zunes, just as it did with the Xbox. And in June, Microsoft will have another product to worry about: the Windows Mobile Killer.